HSSC Group D Recruitment 2018: Online Registration Open for 18,218 Vacancies, Apply Now! Exams » SSC » HSSC Group D Recruitment 2018: Online Registration Open for 18,218 Vacancies, Apply Now! HSSC Group D Recruitment 2018: Haryana Staff Selection Commission, popularly known as HSSC, has released the HSSC Group D Recruitment Notification for recruitment of candidates for the posts Library Attendant, Security Guard, Helper, Sewadar, Beldar, Gauge Reader, Safai Karamchari, etc. in various government departments in the state of Haryana. This is a great opportunity for those who are seeking government jobs. As per the HSSC Group D Recruitment Notification, a total of 18, 218 vacancies are available this year for different posts. The online registration started on 29th August 2018 and the last date to apply was 18th September 2018. However, the last date to apply for HSSC Group D exam 2018 has been extended till 24th September and fees can be deposited till 27th September. Candidates appearing for the exam must have a clear idea about the HSSC Group D Recruitment 2018. In this article, we will provide you with all the information. Read on to find out. There are 116 posts under HSSC Group D Category for 74 Departments/Corporations/Boards of Haryana State Government. You cancheck out the name of the posts, departments, corporations, and boards on the HSSC Group D Official Notification. Age The minimum age of the candidate should be 18 years and the maximum age limit is 42 years. For reserved candidates, there is relaxation of upper age limit. Educational Qualification Candidates must have completed Matriculation from a recognized board with Hindi / Sanskrit as a subject till Matriculation. Step 1 Logon to the HSSC official website: hssc.gov.in. Step 2 Click on “Advt. 4/2018 (Group D Posts)”. Step 3 Click on “Register” on the left side of the screen. Step 4 Click on “Continue To Registration”. Step 5 Read the instructions carefully and click on “Proceed”. Step 6 Fill up your Name, Gender, Contact Details (valid email ID and mobile number), Password, Security Question and its Answer, and click on “Register”. Step 7 Your Application Form Number / Login ID will be generated. Note it down along with the Password, Security Question and Answer. You will need them later. Step 8 Click on “Click on to Login”. Step 9 Enter your Login ID and Password and click on “Sign In”. By clicking on the respective fields. Step 11 Go to “Profile” tab and take print out of the same. Check if you have all the details correctly. Step 12 A declaration form will be generated. Take a print out of the same, sign on it and upload. Step 13 Select the Post you want to apply for. Step 14 Fill up your preferences for Post Category and Department. You can fill up to 15 preferences. Step 15 Make payment of HSSC Group D application fee. You can pay it in both online and offline mode. Step 16 Take print out. Physically Handicapped / Ex-Serviceman of Haryana don’t have to pay any fees. Candidates can make payment of fees through Net Banking (Online) or e-challan (Offline) generated during online registration. 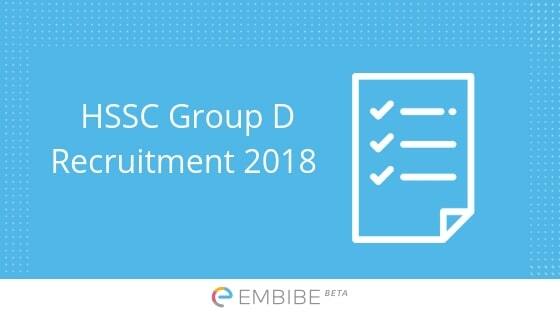 Now that you know everything about HSSC Group D Recruitment 2018, what are you waiting for? If you meet the eligibility criteria, apply for the exam as soon as possible and start your HSSC Group D preparation. As the HSSC syllabus contains more or less the same sections and topics as any other government job exams, take bank mock test series on Embibe for free and take your preparation to the next level. We hope this detailed article on HSSC Group D Recruitment helps you. If you have any query, feel free to drop a comment below. We will get back to you.